Welcome to Cats at Home! I am Dr. Lisa Benisek. Cats at Home is the practice name for my housecalls service devoted entirely to cats and their people. I earned my degree in Veterinary Medicine at Michigan State University in 1988. I also hold an undergraduate degree in Psychology. I have worked in small animal clinics in Lansing and Grand Rapids, including housecalls and feline-exclusive practice for 20 years. I am a member of the American Veterinary Medical Association, the Michigan Veterinary Medical Association, and the American Association of Feline Practitioners. Intent on improving the concept of a cat-friendly practice, Cats at Home opened in 2003. Cats at Home is a convenient way to bring medical care to your cat in his or her familiar environment. 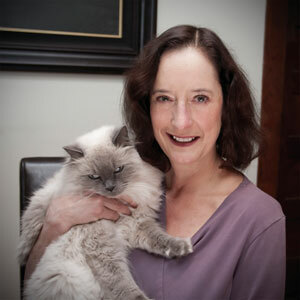 Cats at Home is a veterinary housecalls practice devoted entirely to cats. Cats at Home is inspired by the very nature of cats. Cats at Home is designed for cats that refuse to enter their travel carriers, who do not travel well, who instinctually become too upset to handle in the clinical setting, and for clients who simply want the convenience of having their cat’s veterinarian come to their home. Many cats do better at home. Appointments range from 20-30 minutes and are available days, evenings, and weekends. Please call my home office at 517-393-2287/CATS to schedule an appointment.